Disapproval Resolution. On Tuesday, the House will vote on overriding President Trump’s veto of a resolution that would block his use of emergency powers to use previously appropriated funds for a border wall. Because the vote will fall short of the two-thirds needed to override, the emergency declaration will go into effect. There is no definitive answer yet as to which military construction projects will be affected, but last Monday, March 18, the Pentagon sent Congress a list of $12.9 billion worth of projects that could be used to find $3.6 billion for the wall. The National Emergencies Act, which President Trump used to declare an emergency, provides that a disapproval resolution can be brought up every six months and “certainly we intend to do that,” said Senate Minority Leader Chuck Schumer (D-N.Y.). Upcoming Agenda. On Thursday, the House will vote on a resolution rejecting the President’s ban on transgender Americans serving in the military. Other items on the agenda were set forth on March 18 by House Majority Leader Steny Hoyer (D-Md. ), who said that this three-week work period will see House votes on the Paycheck Fairness Act, which the House will vote on this week; the Violence Against Women Act reauthorization, which will be considered the week of April 1; and the Save the Internet Act of 2019, which will see floor action the week of April 8. The Internet bill, which will be marked up Tuesday in the Energy and Commerce Subcommittee on Communications, would codify the FCC’s net neutrality rule that was implemented during the Obama administration and repealed by the Trump administration. House members leave town April 10. Democrats will attend their annual issues conference, taking place April 10-12 in Lansdowne, Va. The retreat was originally scheduled for February 13-15, but was postponed amid border negotiations. Disapproval Resolution. Because the veto override vote will fail in the House, there is no need for the Senate to vote. Green New Deal. Majority Leader Mitch McConnell (R-Ky.) plans to bring a Democratic proposal to the floor this week – the Green New Deal. Even though the GND is a non-binding resolution and does not have the specificity of a bill, McConnell wants to put Democrats on the spot, supporting or opposing the proposal that strives for net-zero greenhouse gas emissions in the U.S. Minority Leader Schumer is encouraging Democrats to vote “present” on the motion to proceed, but at least one has already broken ranks. Senator Joe Manchin of West Virginia plans to vote “no,” and it's unclear how Senators who co-sponsored the proposal, many of whom are running for President, will vote. Senate Rules Change. The Senate could vote this week on a resolution by Senators Roy Blunt (R-Mo.) and James Lankford (R-Okla.) to change Senate rules for consideration for hundreds of President Trump’s nominees. The resolution would reduce the amount of debate time from 30 hours to as little as two hours for district court nominees and certain executive nominees. The pared-back time limit would not apply to nominees for the Cabinet, the Supreme Court, circuit court judges, and a number of independent boards. To be approved, the rules change would need the support of only a majority of Senators. Republicans have set a record for the number of circuit court judges confirmed during a president’s first two years in office but object to Democratic moves to slow-walk other nominations. FY 2020 Budget / Appropriations. On Wednesday and Thursday, the Senate Budget Committee will consider the FY 2020 budget resolution that Chairman Mike Enzi (R-Wyo.) unveiled on Friday. While Enzi's resolution abides by the budget caps, he believes the steep cuts are unrealistic and it will be necessary to increase the caps. On the House side, Budget Chairman John Yarmuth (D-Ky.) had hoped his panel would mark up its resolution the first week in April, but no dates have been set for action, and there has been speculation that the House committee might not even take a vote on a budget resolution. Because Congress and the President have not yet negotiated an agreement on the spending caps for FY 2020 and there is no chance that the Senate will go along with the House budget resolution, many Democrats see no need to engage in an intra-party battle over spending and revenue priorities. Meanwhile, the House Appropriations Committee is said to be prioritizing bills for consideration, but it is unclear what the top-line spending numbers will be. Five bills are reported to be at the top of the list for action this spring – Defense, Labor-HHS-Education, Legislative Branch, Military Construction-VA, and Energy-Water. Mark up of the first three could begin in late April, and Democrats may opt to package the Defense and Labor-HHS-Ed measures into one bill for floor consideration. U.S.-China Negotiations. U.S. Trade Representative Robert Lighthizer and Treasury Secretary Steven Mnuchin will be in China March 28-29 for another round of trade talks, and China’s lead negotiator could be in Washington next week to continue the negotiations. The U.S. is hoping a deal can be reached by late April. Even after a deal is reached, President Trump said last week that the U.S. will leave tariffs on Chinese goods “for a substantial period of time because we have to make sure that if we do the deal with China that China lives by the deal." USMCA. President Trump has invited House Republicans to the White House Tuesday afternoon to drum up support for the U.S.-Mexico-Canada Agreement. Many Republicans have conditioned their support for USMCA on the Trump Administration removing its 25% steel and 10% aluminum tariffs on Mexican and Canadian products. An Administration push to replace the tariffs with quotas on imported steel and aluminum is being met with resistance by Canada and Mexico. House Ways and Means Trade Subcommittee hearing on trade agreements such as the USMCA and labor issues, "Trade and Labor: Creating and Enforcing Rules to Benefit American Workers." House Armed Services Committee hearing on the FY 2020 defense authorization. House Appropriations Subcommittee on Agriculture hearing on USDA's Proposed Relocation of the Economic Research Service and the National Institute of Food and Agriculture. Senate Energy and Natural Resources Committee hearing on the nomination of David Bernhardt to be Secretary of Interior. The field. Over the weekend, New York Senator Kirsten Gillibrand made her first campaign speech on the steps of the Trump International Hotel in Manhattan, touting her voting record as the most anti-Trump of anyone in the Senate. A much lesser known candidate in the Democratic field is Wayne Messam, mayor of the Miami suburb of Miramar. The son of Jamaican immigrants who worked in the South Florida sugar cane fields, Messam played football at Florida State and then started his own construction business before entering politics. The new DNC debate rules may give Messam a shot at making it on stage for the first two debates in June and July. On the campaign trail. 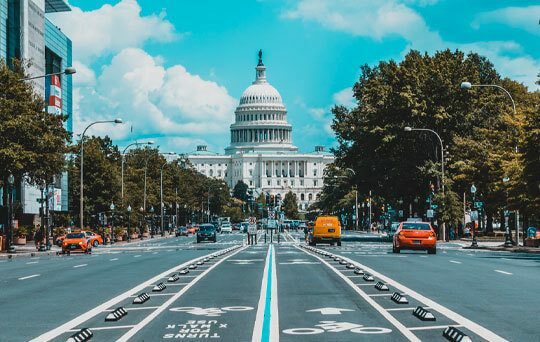 During last week's congressional recess, candidates and potential candidates were crossing the country to promote their campaigns and ideas while looking to build inroads with key communities for the primaries that are less than a year away. South Carolina, Iowa, New Hampshire, and Nevada were all popular stops for most. Senator Kamala Harris focused on Texas, spending time in former Rep. Beto O’Rourke’s backyard, before heading to Atlanta. O’Rourke focused on other states, including Pennsylvania, Michigan, South Carolina, and Ohio, before showing the same relentless energy he approached his 2018 Senate race with as he visited all 10 New Hampshire counties. No-PAC pledge. As we near the end of 2019’s first quarter of campaign fundraising, a popular trend is emerging on the Democratic side as at least 53 members of Congress (36 of whom are freshmen) and all of the Democratic presidential candidates have rejected money from political action committees of corporations and business associations. It’s believed that the rise of small dollar donations has helped level the field for those rejecting corporate PAC money (while helping PAC money move towards party committees and party leaders who by and large still accept PAC money). The Democratic National Committee has embraced this platform of small-dollar donations by allowing candidates who receive donations from 65,000 people in at least 20 different states to be allowed on the Democratic primary debate stage. President Trump. Polls are still being conducted following Friday's submission of the Mueller report, but so far, the President’s approval vs. disapproval numbers have stayed roughly the same – 795 days into his Presidency, Trump sits at 52.9% disapproval vs. 42.1% approval.